This swivel rocker makes the perfect accessory to living rooms and baby rooms as well as casual family entertainment spaces. With dual function technology, this upholstered rocking chair will allow you the ability to gently rock with ease as well as the choice to swivel in spot. 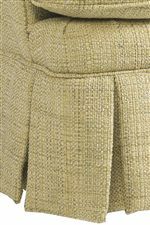 A plush "t" style seat cushion and padded attached back create a comfortable place to sit while traditional rolled arms and welt cord trim reminisce of classic furniture design. Complete with a rolled back for style and a pleated skirt for fashion (also great for preventing under-chair dust build-up), this living room swivel chair is a dual use convenience. 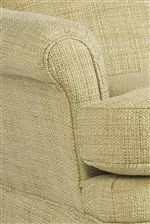 The Nava Comfortable Swivel Rocker by Best Home Furnishings at Best Home Furnishings in the St. Louis, Chesterfield, St. Charles, MO & Waterloo, Belleville, Edwardsville, IL area. Product availability may vary. Contact us for the most current availability on this product. This swivel chair collection features two versions of the beloved swivel chair. Each with a dual purpose construction, these chairs have been created to comfort homes through relaxation, convenience and thick plush cushions. Complete in the traditional style with classic welt cord details, the items in this collection work well in living rooms, baby rooms and casual family entertainment spaces. The Nava collection is a great option if you are looking for Casual furniture in the St. Louis, Chesterfield, St. Charles, MO & Waterloo, Belleville, Edwardsville, IL area.